One of the most important parts of our research, conducted in cooperation with researchers at The National Research Council (NRC), is about how the human ear perceives sound. With actual human subjects, researchers explored the mechanics of audiology, the workings of the human ear, and the way sound impacts the human hearing apparatus. They asked what sounds are most pleasing, what sounds are perceived as accurate and realistic? They did extensive double-blind testing of people, loudspeaker designs and component materials. Midrange response must be smooth and even with coloration reduced to the lowest level possible. On- and off-axis sound must be fundamentally similar. Dispersion must be wide and uniform, ensuring superior imaging and a wide listening area. Distortion must be reduced to lowest levels possible. Bass must be tight yet seamlessly integrated, extended and well-defined. To improve dynamic contrasts and extend sonic realism, power "compression" must be minimized. Paradigm combines these characteristics of human hearing and perception into every loudspeaker design. 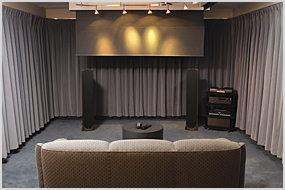 By understanding the scientific reasons behind your appreciation for great sound, Paradigm loudspeakers can deliver it. This is one of Paradigm's state-of-the-art, controlled double-blind listening rooms, where our engineers and researchers perform repeatable, accurate, subjective speaker analysis.